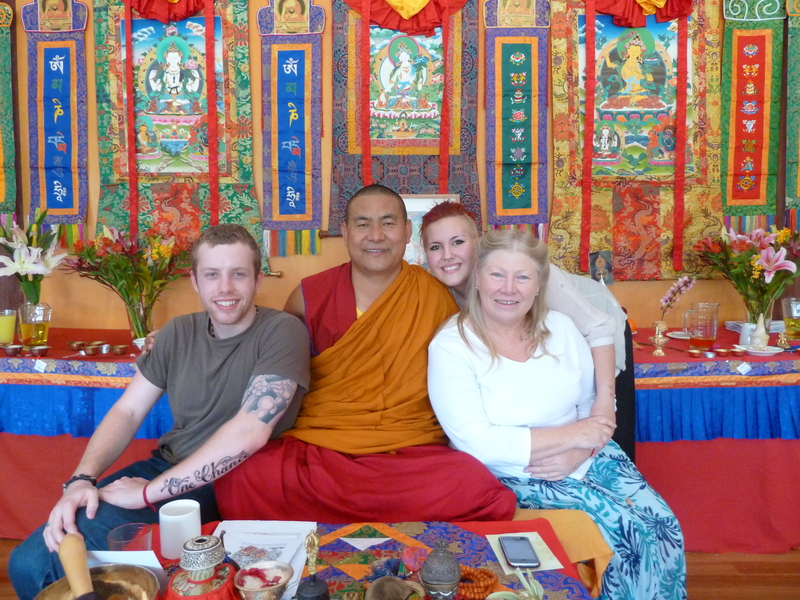 Venerable Lobsang Tendar with some students (I am in the white top) at a retreat last year. I am looking forward to August when at another retreat I will learn more. Tibetans use an ancient form of medicine called “The Knowledge of Healing” whose origins are believed to be based on the teachings of the historical Buddha. In the Tibetan medical tradition, the concept of well-being takes into account the full dynamics of mind, body and spirit to achieve effective and comprehensive healing. It utilizes the power of mantra (a creative repetitive sound) and the power of meditative stabilization. In Tibetan Buddhist healing the notion of the law of karma implies infinite interlinked causes for any single event. Three emotions known as the “Three Interior Poisons” are considered to be the root of all illness. The first poison is desire or passion, which manifests as grasping at objects or pleasant experiences. The second poison is hatred which manifests as pushing away of unpleasant experiences or objects. Finally, ignorance or confusion, the third poison involves misunderstanding the nature of an object or a particular experience. It is vital for anyone involved in healing to develop compassion for without compassion for self and others no true healing can take place. If you are interested in learning more about Tibetan Healing or studying it contact Venerable Lobsang Tendar (There is a link on this site just click on the smiling Buddhist Monk widget) or google Tendar. He is an amazing, humble monk whose life is dedicated to healing. He now lives in Melbourne, Australia but if you live anywhere else in the world I am sure he can advise you on avenues of further study. If you are motivated to study, learn and change I encourage you to do it. Such wise words but like most of us I suspect he was going to do it tomorrow. Make the change today, become a healer, you don’t have to be Tibetan to develop compassion. Mind you they have an awful lot to teach most of us. The teachings of His Holiness the Dalai Lama and Tendar have been a great light to me personally and I am deeply thankful for their sharing of their knowledge and life’s journey. People like them change everyone they come in contact with and in doing so they certainly are changing the world. Inspiring. Thank you – as I am opening to what to study next..I am concentrating on raising my young daughter right now, but I continue to be open – while continuing with my own healing a bit more. Not sure why I still get worried I’ll lose my way..but I am learning to trust my heart.